214 pages | 75 B/W Illus. Historic reconstructions have been a consistent part of the historic preservation and heritage conservation movements in the United States and Canada. Indeed, reconstruction has been the primary tool at the most influential historic sites, for example: the Governor's Palace and the Capitol at Colonial Williamsburg, USA, and in Canada, the Fortress of Louisbourg. Dozens of other reconstructions have appeared during the past century in North America, undertaken by individuals, communities, states, and provinces, and by national agencies responsible for cultural heritage. Despite this prevalence, historic reconstructions have received little scholarly attention and the question of what motivated the proponents of these projects remains largely unexamined. This book explores that question through detailed studies of ten historic reconstructions located throughout Canada and the United States, ranging from 1908 to 2011. Drawing upon diverse archival sources and site investigations, the proponents of each site are given voice to address their need to remake these landmarks, be it to sustain, to challenge, or even subvert a historical narrative, or – with reference to contemporary heritage studies – to reclaim these spaces. Reconstructing Historic Landmarks provides a fascinating insight into these shifting concepts of history in North America and will be of considerable interest both to students and scholars of historic preservation and indeed to heritage professionals involved in reconstructions themselves. "Cogent and consistently engaging, this book greatly enriches the discourse of heritage conservation. Wayde Brown lays bare its inevitable admixture of atavism, alienation and appropriation while acknowledging changing endeavour to capture temporal and cultural authenticity. He deserves particular praise for his articulate review of theory as well as practice, and attention to dominant settler but also indigenous patrimony through his adept selection and interrogation of a sequence of major reconstruction projects across North America. The analysis of these projects properly acknowledges the importance individual actors, and thus the play of prejudice and presumption in the staging of touristic historical recall through place and artifact." "Wayde Brown provides offers a fascinating look at reconstructing historic places that have been destroyed. Opinion has been divided over the value of rebuilding lost heritage. Some favour it for providing a clear picture of what has vanished, while others complain that it introduces new, and sometimes incorrect, ideas about the past. Brown treats this controversial subject generally, while also focussing on well-selected past examples." 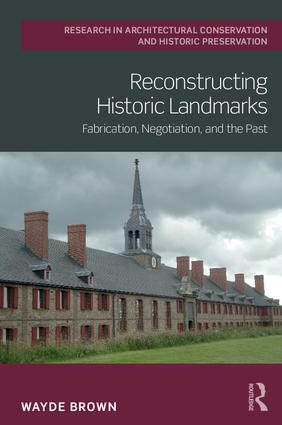 "Reconstructing Historic Landmarks: Fabrication, Negotiation, and the Past is evocative and broadly documents the reconstruction processes and the struggles to align with the public narrative in Canada and the United States. With this book, Wayde Brown invigorates the discussion on reconstruction and authenticity. He clearly illuminates the dichotomy between the opportunities and constraints of evidence-based approaches and the romantic poignancy of the public narrative that arise when reconstructing historic buildings and contexts." "For more than a century, reconstruction of lost and demolished historic buildings has been a significant manifestation of the historic preservation movements in the United States and Canada. Reconstruction of historic buildings is arguably a peculiarly North American expression where colonial experiments, migration, geo-political conflict, and economic and technological change left abandoned places and buildings in their wake. Wayde Brown has gathered here the fascinating histories of the reconstruction of several dozen historic buildings and places in Canada and the United States. Brown’s investigation of a transcontinental sample of reconstructed buildings is a welcome reintroduction to the powerful allure these places exerted and the individuals and organizations who mounted efforts to return them and the history they witnessed to visibility and visitation. Brown’s broad ranging inquiry reminds us that the resurrection of lost buildings not only reconnected past and present but reflected the renewal, and sometimes the invention, of privileged narratives. In an era of "fake news," Brown’s artful summaries of the research and wrangling that lay behind the reconstruction of historic buildings he explores deepens our understanding of how reconstructions have made "lost" history real for generations of historic sites visitors. Brown acknowledges criticisms leveled at reconstructions in the past but draws new attention to their ability to shed false narratives for new ones that bring attention to the agency of historical groups often overlooked in breezy narratives that mask the complexities of historical processes." "Among the remarkable achievements of this highly readable work is Brown’s success in demonstrating the power of the individual to shape collective memory. As much as reconstructed historic landmarks such as Fort Ticonderoga represent group (and often state) action, Brown adeptly illustrates how such sites have frequently been the work of a few key actors, whose personal goals and motivations still permeate these re-created historical spaces—and thus continue to communicate which historical narratives deserve to be prioritized and celebrated." Wayde Brown is an associate professor at the University of Georgia, USA, teaching within the historic preservation program. He holds a PhD from the Welsh School of Architecture, Cardiff, UK, a post-graduate degree in conservation studies from the University of York, UK, and a professional degree in architecture from Dalhousie University, Canada. He is a member of the Royal Architectural Institute of Canada. Wayde Brown's research has been focused on the history of the historic preservation/heritage conservation movement, and especially the motivation to 'make historic sites.' He is currently exploring the use of 'place' in the United States to memorialize the AIDS epidemic.